On the eve of the 2012 election, we were very interested to see the results from a new study from the Pew Research Center which found that 55% of all registered voters have gone online this election season to watch video content related to the election campaign or politican issues. Certainly between the last election and now, consumer behavior has changed significantly with more and more people tuning in to video content on their mobile devices, tablets and connected TVs rather than just on their PC. 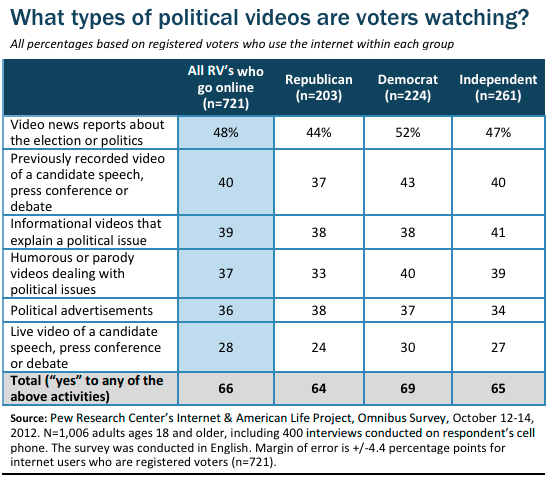 Anytime access to information is the gold standard for how to engage with voters of all ages today, and the new data from Pew Research underscores the importance of video content in the voter education process. In terms of the types of video content that voters are tuning in to, Pew Research found that viewing cuts across news reports, speeches, debates, ads and event videos, among others. Like the rest of the country, we'll be watching closely for the results tomorrow to see how it all plays out. And of course, we'll be particularly interested in looking back on this election to understand the impact that online viewing had in shaping voter's decisions and the outcomes.